This article was originally published on the Auth0.com blog, and is republished here with permission. In this two-part tutorial series, we’ll learn how to build an application that secures a Node back end and an Angular front end with Auth0 authentication. Our server and app will also authenticate a Firebase Cloud Firestore database with custom tokens so that users can leave realtime comments in a secure manner after logging in with Auth0. The Angular application code can be found at the angular-firebase GitHub repo and the Node API can be found in the firebase-auth0-nodeserver repo. Firebase is a mobile and web application development platform. Firebase was acquired by Google in 2014, and continues to be developed under the Google umbrella. Firebase provides NoSQL databases (RTDB, or Realtime Database and Cloud Firestore, in beta at the time of writing) hosted in the cloud and connected using web sockets to provide realtime capabilities to apps. Auth0 is a cloud-based platform that provides authentication and authorization as a service. As an authentication provider, Auth0 enables developers to easily implement and customize login and authorization security for their apps. If you’re already familiar with Firebase’s offerings, you might be asking: why would we implement Auth0 with custom tokens in Firebase instead of sticking with Firebase’s built-in authentication by itself? Firstly, there is an important distinction to make here. Using Auth0 to secure Firebase does not mean you are not using Firebase auth. 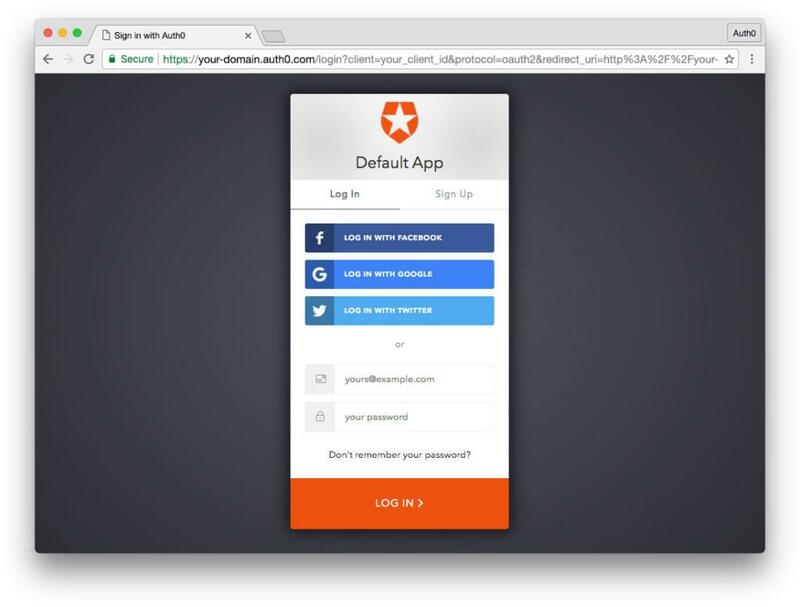 Firebase has a custom authentication approach that allows developers to integrate their preferred identity solution with Firebase auth. This approach enables developers to implement Firebase auth so that it functions seamlessly with proprietary systems or other authentication providers. There are many potential reasons we might want to integrate Auth0 with Firebase authentication. Alternatively, there are scenarios where using basic Firebase auth by itself could suffice. Let’s explore. Only need a small handful of login options and do not need enterprise identity providers, integration with your own user storage databases, etc. Do not need to adhere to compliance regulations regarding the storage of user data. Need to integrate enterprise identity providers, such as Active Directory, LDAP, ADFS, SAMLP, etc. Want features like customizable passwordless login, multifactor authentication, breached password security, anomaly detection, etc. Must adhere to compliance regulations such as HIPAA, GDPR, SOC2, etc. Essentially, Firebase’s basic authentication providers should suffice if you have a very simple app with bare-bones authentication needs and are only using Firebase databases. However, should you need more than that, Firebase offers a great way to use their services with other authentication solutions. This is a much more realistic scenario that many developers will be faced with, so we’ll explore it in detail here. We’re going to build a Node.js API secured with Auth0 that mints custom Firebase tokens and also returns data on ten different dog breeds. 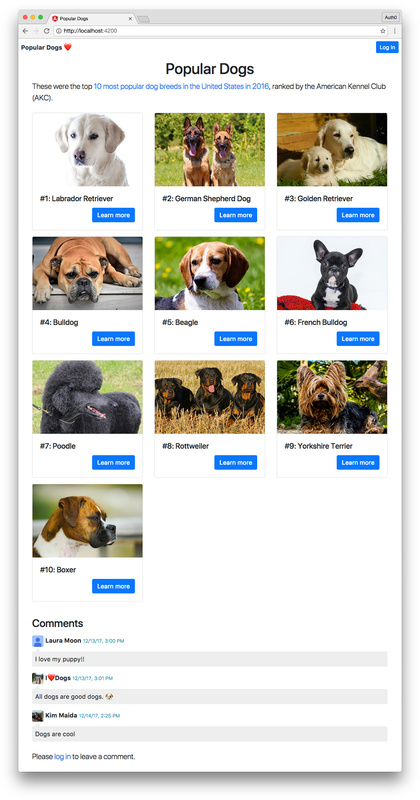 We’ll also build an Angular front end app called “Popular Dogs” that displays information about the ten most popular dogs in 2016, ranked by public popularity by the American Kennel Club (AKC). Our app will be secured by Auth0, call the Node API to fetch dog data, and call the API to acquire Firebase tokens to authorize users to add and delete comments in realtime with Cloud Firestore. The app will use shared modules as well as implement lazy loading. We will generate our Angular app and nearly all of its architecture using the CLI. You’ll need an Auth0 account to manage authentication. You can sign up for a free account here. Next, set up an Auth0 client app and API so Auth0 can interface with the Angular app and Node API. Go to your Auth0 Dashboard and click the Create a New Client button. Name your new app (something like Angular Firebase) and select Single Page Web Applications. In the Settings for your new Auth0 client app, add http://localhost:4200/callback to the Allowed Callback URLs. Enable the toggle for Use Auth0 instead of the IdP to do Single Sign On. At the bottom of the Settings section, click “Show Advanced Settings”. Choose the OAuth tab and verify that the JsonWebToken Signature Algorithm is set to “RS256”. If you’d like, you can set up some social connections. You can then enable them for your app in the Client options under the Connections tab. The example shown in the screenshot above uses username/password database, Facebook, Google, and Twitter. Note: For production, make sure you set up your own social keys and do not leave social connections set to use Auth0 dev keys. Go to APIs in your Auth0 dashboard and click on the “Create API” button. Enter a name for the API, such as Firebase Dogs API. Set the Identifier to your API endpoint URL. In this tutorial, our API identifier is http://localhost:1337/. The Signing Algorithm should be “RS256”. You can consult the Node.js example under the Quick Start tab in your new API’s settings. In the next steps, we’ll implement our Node API in this fashion using Express, express-jwt, and jwks-rsa. We’re now ready to implement Auth0 authentication on both our Angular client and Node back-end API. Next you will need a free Firebase project. Go to the Firebase Console and sign in with your Google account. In the dialog that pops up, give your project a name (such as Angular Firebase Auth0). A project ID will be generated based on the name you chose. You can then select your country/region. In order to mint custom Firebase tokens, you’ll need access to the Firebase Admin SDK. 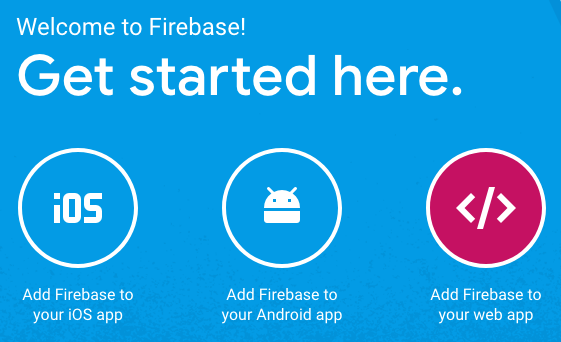 To obtain access, you must create a service account in your new Firebase project. In the settings view, click the Service Accounts tab. The Firebase Admin SDK UI will appear, showing a configuration code snippet. Node.js is selected by default. This is the technology we want, and we will implement it in our Node API. Click on the Generate New Private Key button. A dialog will appear warning you to store your private key confidentially. We will take care never to check this key into a public repository. Click on the Generate Key button to download the key as a .json file. We will add this file to our Node API shortly. The completed Node.js API for this tutorial can be found at the firebase-auth0-nodeserver GitHub repo. Let’s learn how to build this API. This .gitignore configuration ensures that Git will ignore any files and folders inside the firebase directory except for the .gitignore file itself. This allows us to commit an (essentially) empty folder. Our .json Firebase Admin SDK key can live in this folder and we won’t have to worry about gitignoring it by filename. Note: This is particularly useful if we have the project pulled down on multiple machines and have different keys (with different filenames) generated. Next we’ll add the data for ten dog breeds. For brevity, you can simply copy and paste this data into your dogs.json file. We’ll need body-parser, cors, and express to serve our API endpoints. Authentication will rely on express-jwt and jwks-rsa, while Firebase token minting is implemented with the firebase-admin SDK (which we’ll have access to using the key we generated). This will launch our Node server with Express at http://localhost:1337/. Note: Notice that this is the API identifier we set up in Auth0. Provides a secure GET* endpoint that returns a specific dog’s detailed data, requested by rank. *Endpoints use variations of the same base dataset to simulate a more complex API. You can read the code comments for more detail. The API will then be available at http://localhost:1337. Note: If you try to access secure routes in the browser, you should receive a 401 Unauthorized error. That’s it for our server! Keep the API running so that it will be accessible to the Angular app, which we’ll set up next. Now it’s time to create our Angular app and set up some additional dependencies. The --routing flag generates an app with a routing module and --skip-tests generates the root component with no .spec.ts file. Note: For brevity, we are not going to cover testing in this article. If you’d like to learn more about testing in Angular, check out the tutorial’s conclusion for more resources. We will need the auth0-js library to implement Auth0 authentication in our Angular app. We’ll also need the firebase JS SDK and the angularfire2 Angular Firebase library to implement our realtime comments with Firebase. The app will run in the browser at http://localhost:4200. We’re going to use the Angular CLI to generate the complete architecture for our app up front. This way, we can make sure that our modules are functioning properly before we implement our logic and templates. Our app is going to use a modular approach with lazy loading. The sample app in this tutorial is small, but we want to build it in a scalable, real-world manner. The root module has already been created when the Angular app was generated with the ng new command. The root module lives at src/app/app.module.ts. Any components we generate in our Angular app without another module’s subdirectory specified will be automatically imported and declared in our root module. We’ll use the callback component to handle redirection after the user logs into our application. It’s a very simple component. Note: g is a shortcut for generate. We could also use c as a shortcut for component, making this command ng g c. However, this tutorial will not use shortcuts for the type of files generated, in the interest of clarity. Creating the module first ensures that components created in that module’s folder will then be imported and declared automatically in that parent module instead of the app’s root module. Note: If you wish to use a shared module’s components in another module, you need to export the components as well as declare them. We can do this automatically with the CLI using the --export=true flag. This is the basic architecture for the shared core services, components, and models that our app will need access to. Our Auth module supplies the service and route guard we need to manage authentication, but does not have any components. This is also a shared module. Replace placeholders in <angle brackets> with your appropriate Auth0, Firebase, and API information. You can find your Auth0 configuration in your Auth0 Dashboard in the settings for the client and API you created for this tutorial. The last thing we’ll do before we begin implementing functionality in our Angular app is add a loading image. Create the following folder: src/assets/images. Let’s set up our modules. We’ll import the shared modules (CoreModule and AuthModule) in our root AppModule. Since this is a shared module, we’ll import the other modules, services, and components that we’ll need access to throughout our app. Note: The CommonModule is imported in all modules that are not the root module. In our imports array, we’ll add any modules that may be needed by services or components in the CoreModule, or that need to be available to other modules in our app. The CLI should have automatically added any generated components to the declarations array. The exports array should contain any modules or components that we want to make available to other modules. Note that we have imported ModuleWithProviders from @angular/core. Using this module, we can create a forRoot() method that can be called on import in the root app.module.ts when CoreModule is imported. This way, we can ensure that any services we add to a providers array returned by the forRoot() method remain singletons in our application. In this manner, we can avoid unintentional multiple instances if other modules in our app also need to import the CoreModule. We’ll import ModuleWithProviders to implement a forRoot() method like we did with our CoreModule. Then we’ll import our AuthService and AuthGuard. We also need to import AngularFireAuthModule from angularfire2/auth so we can secure our Firebase connections in our AuthService. The service and guard should then be returned in the providers array in the forRoot() method. We’ll need to import the CoreModule so we can utilize its exported FormsModule, LoadingComponent, and ErrorComponent. We also need to access our configuration from the environment.ts file. Comments use Firebase’s Cloud Firestore database, so let’s import the AngularFireModule and AngularFirestoreModule as well as our two components: CommentsComponent and CommentFormComponent. When we add AngularFireModule to the @NgModule’s imports array, we’ll call its initializeApp() method, passing in our Firebase configuration. Both of our components should already be in the declarations array, and the CommentsComponent should already be added to the exports array so that other components from other modules can use it. Note: We don’t need to export CommentsFormComponent because it’s a child of CommentsComponent. The CommentsModule does not provide any services, so there’s no need to implement a forRoot() method. The AppComponent and CallbackComponent have already been added automatically by the CLI. When we add our CoreModule and AuthModule to the imports array, we’ll call the forRoot() method to ensure no extra instances are created for their services. The CommentsModule doesn’t provide any services, so this is not a concern for that module. We have two modules that require routing: the DogsModule for the main listing of dogs, and the DogModule, which contains the component showing a dog breed’s detail page. We’ll import our CallbackComponent and AuthGuard. The remaining routes will be string references to modules rather than imported components using the loadChildren property. We will set the default '' path to load route children from the DogsModule, and the 'dog' path to load route children from the DogModule. The 'dog' path should also be protected by the AuthGuard, which we declare using the canActivate property. This can hold an array of route guards should we require more than one. Finally, the 'callback' route should simply point to the CallbackComponent. We’ll import Routes and RouterModule in addition to our CoreModule and CommentsModule (comments will appear on the main dogs listing page). This module has a child route, so we’ll create a constant that contains an array to hold our route object. The only child route we’ll need inherits the '' path from app-routing.module.ts, so its path should also be ''. It will load the DogsComponent. In our imports array, we’ll pass our DOGS_ROUTES constant to the RouterModule‘s forChild() method. Another difference is that we will not import the CommentsModule. However, we could add comments to dog details in the future if we wished. Our app’s architecture and routing are now complete! The app should successfully compile and display in the browser, with lazy loading functioning properly to load shared code and the code for the specific route requested. We’re now ready to implement our application’s logic. The loading and error components are basic, core UI elements that can be used in many different places in our app. Let’s set them up now. The LoadingComponent should simply show a loading image. (Recall that we already saved one when we set up the architecture of our app.) However, it should be capable of displaying the image large and centered, or small and inline. <strong>Error:</strong> There was an error retrieving data. Now let’s implement the code necessary to get our AuthModule‘s features working. We’ll need the authentication service in order to build out the header in the CoreModule, so it makes sense to start here. We’ve already installed the necessary dependencies (Auth0 and FirebaseAuth), so let’s begin. Create a logout() method to clear session and sign out of Firebase. Open the auth.service.ts file that we generated earlier. For tutorial brevity, please check out the full code in the GitHub repo’s auth.service.ts file here. There’s a lot going on, so let’s go through it step by step. First, as always, we’ll import our dependencies. This includes our environment configuration we set up earlier to provide our Auth0, Firebase, and API settings, as well as auth0 and firebase libraries, AngularFireAuth, HttpClient to call the API to get a custom Firebase token, and the necessary RxJS imports. You can refer to the code comments for descriptions of the private and public members of our AuthService class. Next is our constructor function, where we’ll make Router, AngularFireAuth, and HttpClient available for use in our class. If a redirect URL segment is passed into the method, we’ll save it in local storage. If no redirect is passed, we’ll simply store the current URL. We’ll then use the _auth0 instance we created in our members and call Auth0’s authorize() method to go to the Auth0 login page so our user can authenticate. These methods are fairly self-explanatory: they use Auth0 methods parseHash() and userInfo() to extract authentication results and get the user’s profile. We’ll also set our service’s properties to store necessary state (such as whether the user’s authentication state is loading and if they’re logged in or not), handle errors, save data to our service and local storage, and redirect to the appropriate route. We’ll create a getToken$ observable from the GET request to our API’s /auth/firebase endpoint and subscribe to it. If successful, we’ll pass the returned object with the custom Firebase token to the _firebaseAuth() method, which will authenticate with Firebase using Firebase’s signInWithCustomToken() method. This method returns a promise, and when the promise is resolved, we can tell our app that Firebase login was successful. We can also schedule Firebase token renewal (we’ll look at this shortly). We’ll handle any errors appropriately. Our custom Firebase token will expire in 3600 seconds (1 hour). This is only half as long as our default Auth0 access token lifetime (which is 7200 seconds, or 2 hours). To avoid having our users lose access to Firebase unexpectedly in the middle of a session, we’ll set up automatic Firebase token renewal with two methods: scheduleFirebaseRenewal() and unscheduleFirebaseRenewal(). Note: You can also implement automatic session renewal with Auth0 in a similar manner using the checkSession() method. In addition, you could use checkSession() to restore an unexpired authentication session in the constructor if a user navigates away from the app and then returns later. We won’t cover that in this tutorial, but this is something you should try on your own! To schedule automatic token renewal, we’ll create a timer observable that counts down to the token’s expiration time. We can subscribe to the expiresIn$ observable and then call our _getFirebaseToken() method again to acquire a new token. The signInWithCustomToken() angularfire2 auth method returns a promise. When the promise resolves, scheduleFirebaseRenewal() is called, which in turn ensures that the token will continue to be renewed as long as the user is logged into our app. We’ll also need to be able to unsubscribe from token renewal, so we’ll create a method for that as well. The logout() method removes all session information from local storage and from our service, signs out of Firebase Auth, and redirects the user back to the homepage (the only public route in our app). The tokenValid accessor method checks whether the Auth0 access token is expired or not by comparing its expiration to the current datetime. This can be useful for determining if the user needs a new access token; we won’t cover that in this tutorial, but you may want to explore Auth0 session renewal further on your own. That’s it for our AuthService! Recall that we created a CallbackComponent in our root module. In addition, we set our environment‘s Auth0 redirect to the callback component’s route. That means that when the user logs in with Auth0, they will return to our app at the /callback route with the authentication hash appended to the URI. We created our AuthService with methods to handle authentication and set sessions, but currently these methods aren’t being called from anywhere. The callback component is the appropriate place for this code to execute. All our callback component needs to do is show the LoadingComponent while the AuthService‘s handleAuth() method executes. The handleLoginCallback() method will parse the authentication hash, get the user’s profile info, set their session, and redirect to the appropriate route in the app. Now that we’ve implemented the authentication service, we have access to the properties and methods necessary to effectively use authentication state throughout our Angular application. Let’s use this logic to implement our AuthGuard for protecting routes. Using the Angular CLI should have generated some helpful boilerplate code, and we only have to make a few minor changes to ensure that our guarded routes are only accessible to authenticated users. Note: It’s important to note that route guards on their own do not confer sufficient security. You should always secure your API endpoints, as we have done in this tutorial, and never rely solely on the client side to authorize access to protected data. We’ll import AuthService add a constructor() function to make the service available in our route guard. The canActivate() method should return true if conditions are met to grant access to a route, and false if not. In our case, the user should be able to access the guarded route if they are authenticated. The loggedIn property from our AuthService provides this information. If the user does not have a valid token, we’ll prompt them to log in. We want them to be redirected back to the guarded route after they authenticate, so we’ll call the login() method and pass the guarded route (state.url) as the redirect parameter. Note: Remember that we set up our entire app’s architecture and routing earlier. We already added AuthGuard to our dog details route, so it should be protected now that we’ve implemented the guard. The last thing we’ll do in this section of our tutorial is build out the remaining components and services that belong to our CoreModule. We’ve already taken care of the LoadingComponent and ErrorComponent, so let’s move on to the header. We’ll add a few simple styles and import our AuthService to make its members publicly available to our header component’s template. Now that we have our header component built, we need to display it in our app. The header component will now be displayed in our app with the current routed component showing beneath it. Check it out in the browser and try logging in! Let’s implement our dog.ts and dog-detail.ts interfaces. These are models that specify types for the shape of values that we’ll use in our app. Using models ensures that our data has the structure that we expect. With our Node API and models in place, we’re ready to implement the service that will call our API in the Angular front end. We’ll add the necessary imports to handle HTTP in Angular along with the environment configuration, AuthService, RxJS imports, and Dog and DogDetail models we just created. We’ll set up private members for the _API and to store the _accessToken, then make the HttpClient and AuthService available privately to our API service. Our API methods will return observables that emit one value when the API is either called successfully or an error is thrown. The getDogs$() stream returns an observable with an array of objects that are Dog-shaped. The getDogByRank$(rank) stream requires a numeric rank to be passed in, and will then call the API to retrieve the requested Dog‘s data. This API call will send an Authorization header containing the authenticated user’s access token. Finally, we’ll create an error handler that checks for errors and assesses if the user is not authenticated and prompts for login if so. The observable will then terminate with an error. Note: We are using arrow functions to pass parameters to our handler functions for RxJS pipeable operators (such as catchError). This is done to preserve the scope of the this keyword (see the “No separate this” section of the MDN arrow functions documentation). In the next installment of our Auth0 + Firebase + Angular tutorial, we’ll display data from our dogs API and learn how to set up and implement realtime comments with Firebase! Check out Authenticating Firebase and Angular with Auth0: Part 2 now. Technical Content Lead at @Auth0. Angular GDE. Angular Consultant. Formerly: Senior UI Engineer. Past life: Animal Behavior & Neurobiology.